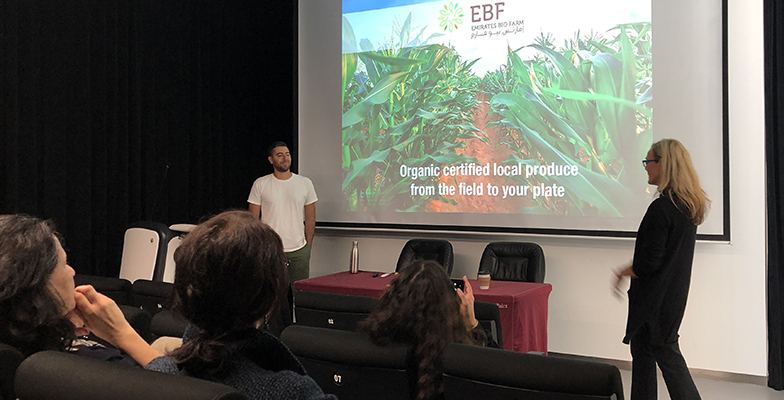 As part of the ongoing AUS Sustainability Speaker Series, Yazen Al Kodmani, Operations Manager at Emirates Bio Farm (EBF), discussed the importance of being more mindful as consumers and eating healthier food during a talk hosted at American University of Sharjah (AUS) on March 20, 2019. Al Kodmani said that consumers will start making the right decisions when they value locally grown organic products over imported non-organic ones. He said that EBF tries to raise awareness of this issue and educate the local community through various events that it holds regularly, such as Open Farm days and school trips. The speaker described organic farming as planting without the use of chemicals, particularly pesticides and herbicides. In practice, this encourages farmers to rediscover the traditional agricultural methods, where the absence of chemicals forces alternating crops throughout the field instead of being a monocrop farm (specialized in one crop). In this case, harvesting can only be done by hand, and it cannot be automated. Al Kodmani explained that while this method is labor intensive and time consuming, it is environmentally rewarding and achieves the goal of being sustainable. Going back to old methods is also part of what Al Kodmani refers to as “permaculture,” which is a concept of building soil sustainably and encouraging self-sufficient agriculture. He described it as “doing things the way our grandparents used to do.” Permaculture creates an ecosystem that does not rely on artificial or chemical inputs to enrich the soil, he further explained. Al Kodmani emphasized that “by getting rid of biodiversity, we get rid of all the available knowledge present in nature.” He explained that biodiversity is lost when the variety of seed types is reduced, and only those seeds that are deemed to be “the best” are kept, meaning those that are the most resistant, most productive and best-looking seeds. However, limiting the variety of seeds available can lead to the eradication of many plants due to susceptibility to certain diseases. Towards the end of his lecture, Al Kodmani discussed how important it is for farmers to choose the right location for their projects. He said that EBF chose the city of Al Ain because they need to have sweet soil and water, as well as a dry environment, which means staying away from the coastline. Considering EBF’s location, which is a few minutes away from the Hatta Mountain Range, Al Kodmani said that the farm’s main water source is the area’s groundwater. He added that Hatta is a natural water collection area that caters to their needs. Finally, Al Kodmani discussed the progress EBF has witnessed over the past three years. He said that due to the agricultural methods they are following, their usage of an organic chicken fertilizer has been reduced to a quarter of what it had been three years ago. This is a sign of the ecosystem being created within the soil, and its enrichment due to the organic farming methods that EBF applies.